Even on this beautiful summit, sometimes you just have to get away. So last week we hooked up the trailer, put the kayaks on the roof racks, and headed down one of our favorite drives, down Highway 395 to Lee Vining. Lee Vining canyon is the gateway to the east side of Yosemite and Mono Lake sits right at the foot of the canyon. The first day it was a little hazy in the valley so we headed up the Tioga grade past Tuolumne Meadows to Lake Tenaya. Kayaking this spectacutlar high sierra lake made famous by Ansel Adams had been a goal of ours for the last few years. It was a perfect day and we put in on the east end of the lake and did a lazy paddle around the entire lake. It is a special treat to be at lake level and be surrounded by the granite domes and peaks of this special part of the Sierras. We recommend this easy paddle to everyone that enjoys the outdoors. Just make sure you pick a day with no winds. The next day we were rewarded with clear visibility over the valley and Mono Lake. We have been fortunate to have beautiful days of kayaking on Mono Lake before and this was another great day. No wind and clear skies. We drove out to the South Tufa area where we put in the kayaks at Navy Beach. Kayaking through the Tufa is a like a Disneyland ride. 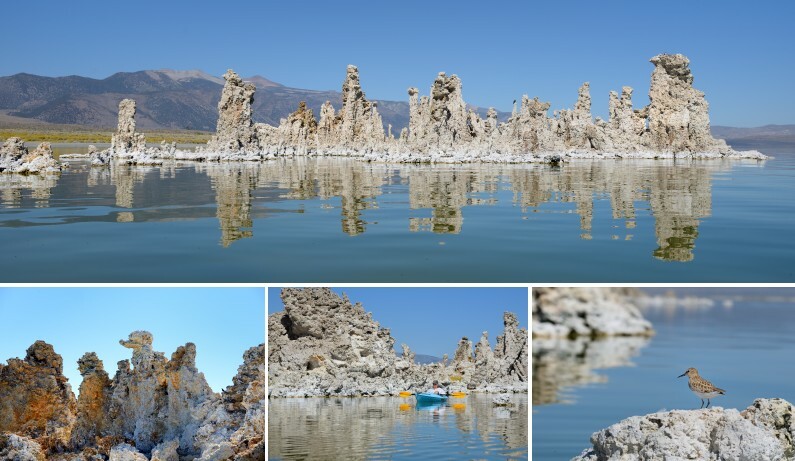 The Tufa formations form hundreds of pinnacles and turrets like small castles in the lake. We had to keep our distance from a noisy Osprey chick that was still in its nest on the top of one of the turrets. This is another must do kayaking trip that we can highly recommend. We also had one other adventure at the South Tufa area. We brought along our camera drone and flew it over the tufa formations. It was a completely different way to see these strange formations. Here is some video of that fly over. Make sure you view this full frame to get the best effect. This entry was posted in Off the summit. Bookmark the permalink.